Discounts are available for 2'-F Bases! 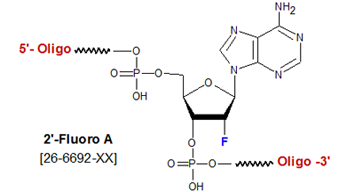 2'-Fluoro-Bases (2'-F bases) is classified as a 2'-Fluoro RNA monomer. The substitution of a highly electronegative fluorine atom for the 2'-OH group of the ribose results in the ring of a 2'-F-ribonucleoside having a C3'-endo (i.e., RNA-type) conformation. Consequently, an RNA oligonucleotide containing a 2'-F RNA monomer adopts the more thermodynamically stable A-form helix on hybridization to a target (1).